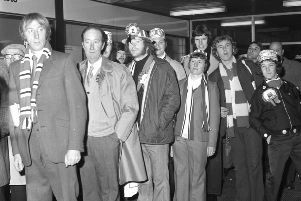 Fans leaving for London at Sunderland Station' in 1973. We all remember what happened on the pitch in 1973 but what were your memories of getting to Wembley the last time Sunderland won there? We asked our readers and dozens replied. Here is what you had to say. They were all set to board the train. Barry Emmerson said: “Flew down from Teesside with my dad to Luton Airport and coach to Wembley and back. It was £14 return and was organised through travel company in Binns. On their way to Wembley in 1973. Thanks to all who took an interest in the post - all 20,000 of you. Cup fever gripped Sunderland in 1973.